Rachel’s gown included a skirt with four layers in all – the Dupioni over skirt, ivory tulle over satin for the under skirt, and of course lining. 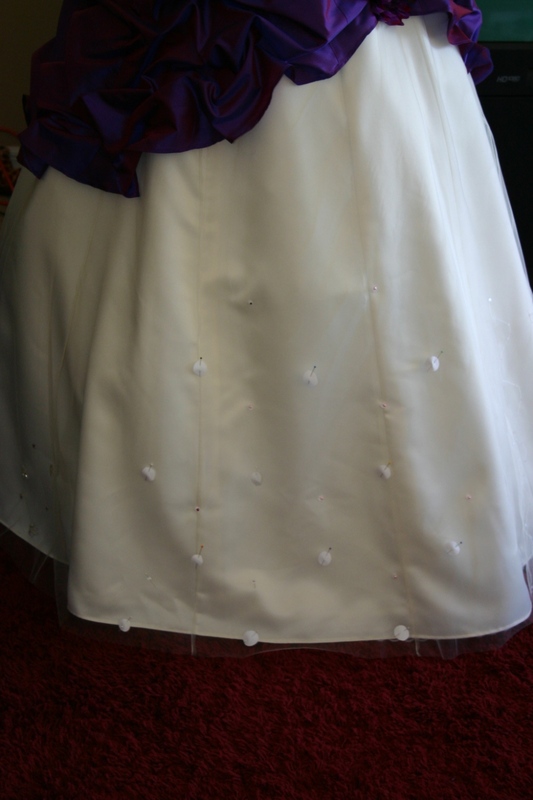 I had to sew the tulle layer twice; my iron has a Teflon shoe and so it does not melt fabrics, which unfortunately allowed me to neglect to turn the temperature down low enough for the delicate tulle fabric. It didn’t melt, but it shrank badly the first time. I didn’t notice my mistake until I’d sewn the entire tulle layer, pinned it to the satin, and realized it was a good six inches shorter than the satin layer! Thankfully I buy tulle by the bolt and had plenty on hand to correct my error quickly, without any delays to Rachel. My newest client Rachel was asked to be maid of honor at her friend’s wedding a couple of months ago – an honor of course, but there was a slight problem. The bride chose strapless gowns for her bridesmaids, and Rachel’s curvy figure demanded better support than an off-the-rack strapless bra was going to provide. Rachel asked a mutual friend, Ann-Michelle, to help her find a suitable corset at one of the lingerie shops in the mall. Ann-Michelle told her for a suitable corset, the mall was not the place to go! I discussed the options for corsets with Rachel. We talked about the sort of shape and cut she wanted (fairly long lined, coming to a V at the front), the neckline (sweetheart), and kind of closure (front busk, back lacing), as well as the degree of shaping and support that would be appropriate (supportive enough to have a showdown with gravity and win). We also talked about fabrics. Rachel’s corset was going to be worn to her friend’s wedding, but also to her own a few months later, so we definitely wanted fabrics that had a beautiful, bridal feel to them. The time frame was tight and didn’t allow us to shop around, but I had some gorgeous cream and pale gold silk brocade in stock and Rachel really loved it! There wasn’t quite enough for the whole corset, so we made one panel in an accent fabric – champagne satin – which ultimately emphasized the hourglass shape the corset created. I hand dyed the laces champagne as well, to match. 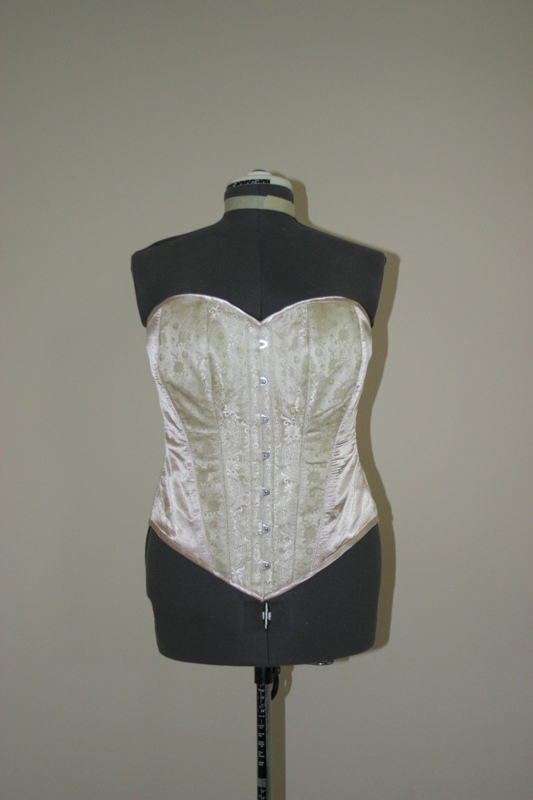 The fashion fabrics sit over two layers of sturdy cotton corset fabric so the corset is strong and durable. The entire bodice is supported by 22 pieces of flat and spiral steel bonings, as well as the front busk. We met during the construction of her corset for fittings and made a few adjustments (both for fit, and to ensure the neckline of the corset didn’t show above the neckline of her bridesmaid gown). A good fit is infinitely more comfortable, and more supportive as well! The end result was exactly what she’d needed. Rachel was thrilled! She told me she’d been dreading her friend’s wedding a bit when she hadn’t known how she was going to manage the strapless gown, but with the corset she was looking forward to it again. After the wedding, she sent me a message to let me know it had been comfortable the whole day, and she’d even found an opportunity to wear it again since. Music to a corset maker’s ears! Hillary wanted a nice crisp fabric for this dress, so the fitted bodice and pleated skirt would hold a nice shape. We reviewed a number of swatches and settled on a beautiful Dupioni Silk in a beautiful, subtle black-on-charcoal two toned color. We picked a lightweight black Habotai silk for the lining, and an invisible zipper for the back closure. The dress has a square neckline, fitted bodice, three quarter sleeves, and a pleated below-knee-length skirt with corner pockets. The belt shown here is removable, and I made two others (in blue taffeta and purple Dupioni) so Hillary can mix things up when she’s feeling colorful. This was an awesome project to work on… one of the rare treats where the stars align and things fall into place the right way the first time. 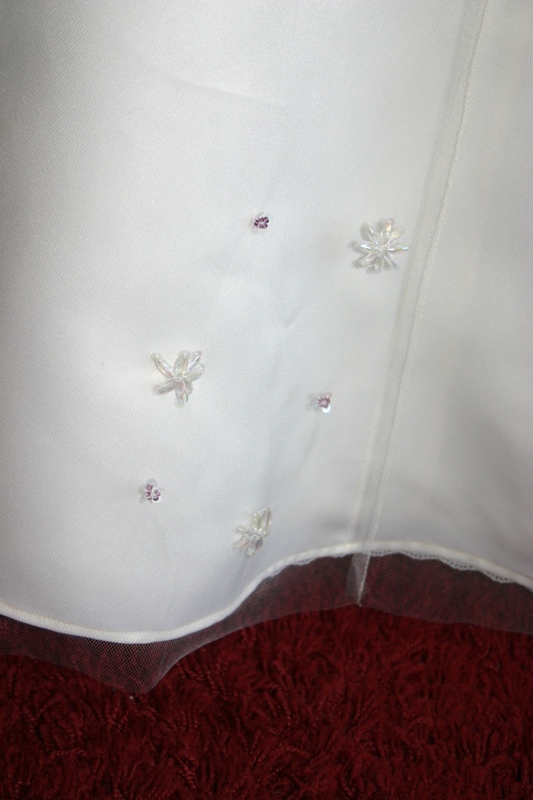 The notable graining in the fabric lines up perfectly along the bodice darts. The neckline lays flat, crisp, and square and sits just exactly below her collarbone to frame her shoulders and face perfectly. 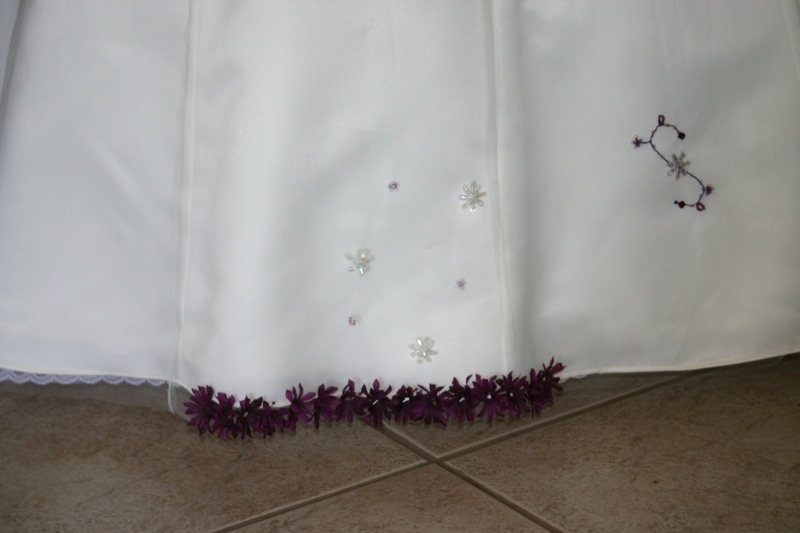 The sleeve and skirt hems are straight with even stitching. The invisible zipper is invisible. All the details that ought to be right on a custom garment, are. 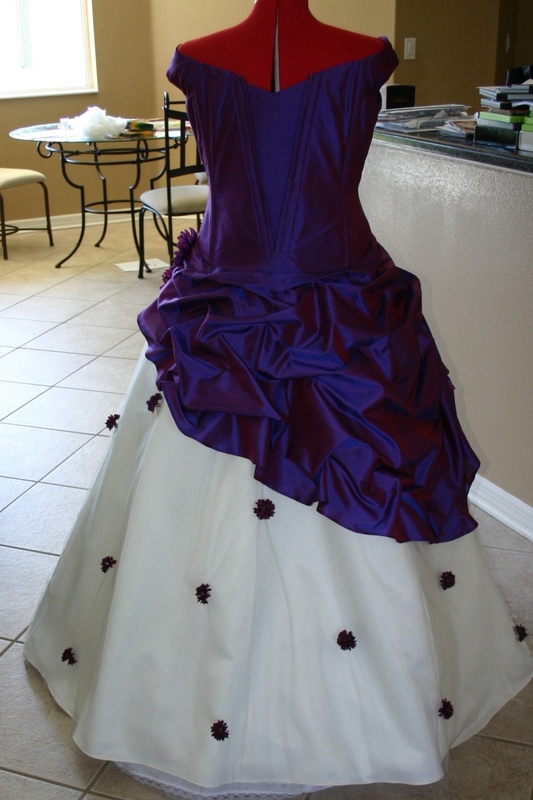 This gown was custom designed for a client with a beautiful, dramatic hourglass figure for a formal event this autumn. She has a very difficult time finding clothing that flatters her figures, as most gowns that fit her bust and hips are far too loose for her narrow waist, making her look shapeless and larger than she is. She wanted a design that accentuated her waistline, and expressed an interest in a one-shoulder strap. I sent her sketches of several ideas, and the gown below was her favorite. This custom dress was created with beautiful hand dyed silk satin and silk crinkle chiffon fabrics. 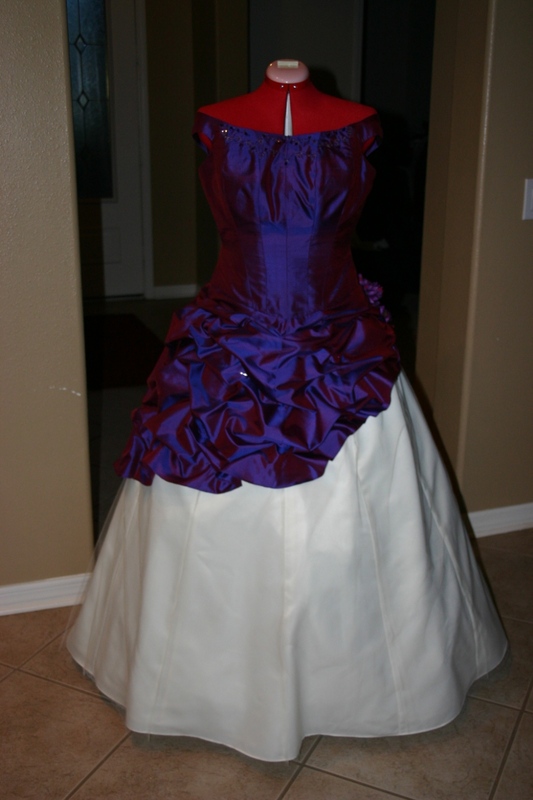 The strapless dress has boning through the bodice for support, and the skirt is finished with a machine rolled hem. 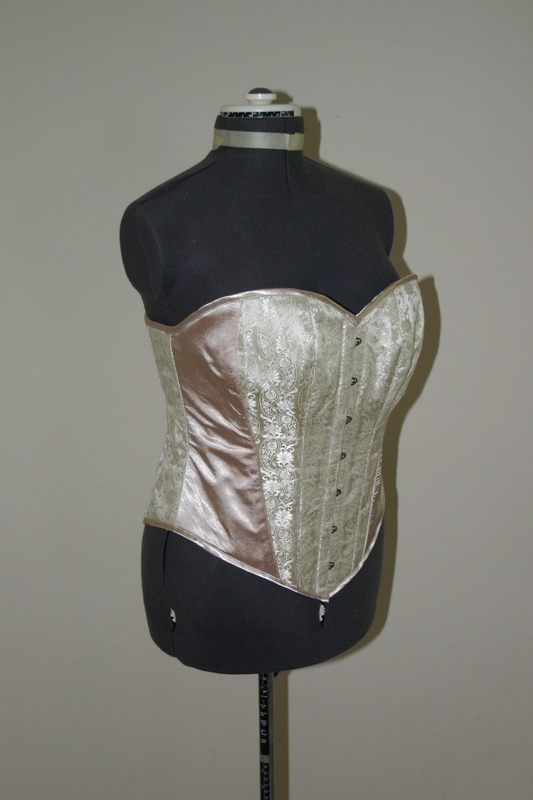 This beautiful corset was made with a stunning silk brocade fabric over high quality cotton coutil. It was custom designed with a high back and open bust. 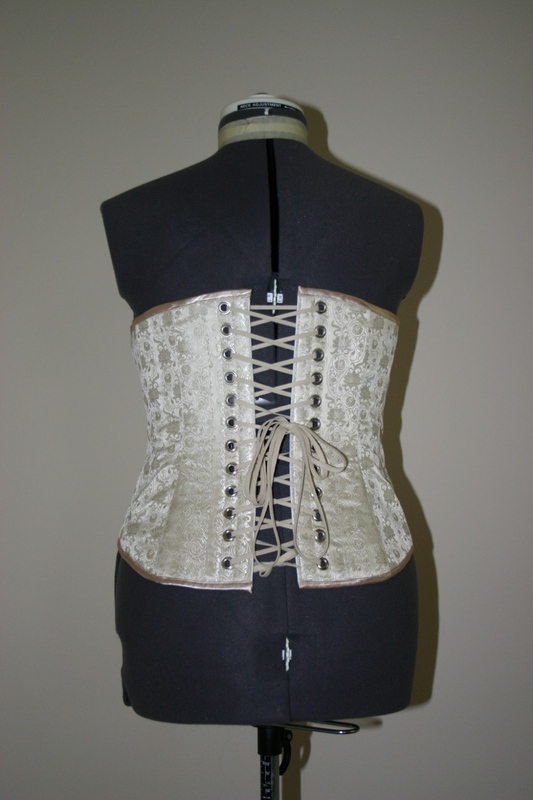 The corset has a front busk closure, and laces up the back through 44 metal grommets! 22 pieces of steel boning provide incredible support and beautiful shaping. This stunning corset was created for one of my clients on etsy. If you haven’t seen it already, check out my shop to view other items available for sale or to request a custom piece!